Our first stop after getting back home from Gotland was to visit Sverige’s fiance’s mum and pick up Göran who had been holidaying there while we were away. They live on a working farm in a really beautiful house, it felt so peaceful. 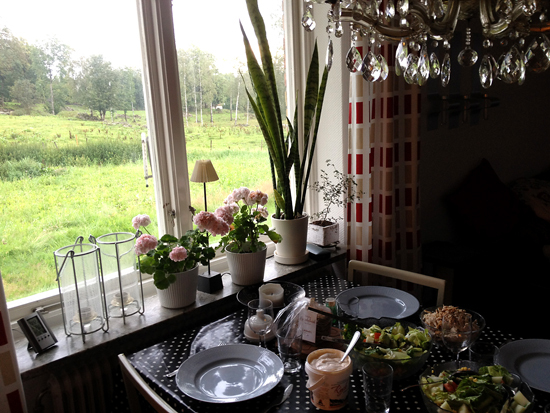 We settled down to have dinner at this pretty table and I had to take a pic of the window as I find Swedish windows so inspiring. Not just for the view outside them, but also for the way they are dressed. Sverige told me that it is a Swedish style to dress windows with candles, lights, flowers and light curtains to bring in some light and cheerfulness. That came about because the winters are long and dark, the sun rises late and sets early, but just because it’s dark outside doesn’t mean it has to be inside! I love it! Sydney based, coastal dwelling. When I'm not at work I'm somewhere outdoors, or in the yoga studio, or at my local cafe, or pottering at home.